TAURI WORLD is a real-time game with an extensive dependency system and a multi-layered structure. 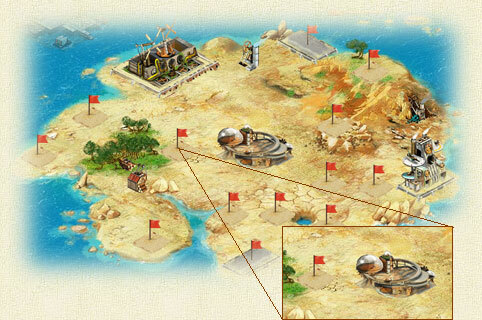 In TAURI you can find over 20 types of buildings, and over 25 types of units - defense systems, aircraft and land units. A unique system of colonization has been created to give players the opportunity to settle up to 8 islands on each of 3 available planets. Heroes and bonuses simplify the game. Thanks to bonuses, you can produce buildings, units and technologies more quickly, efficiently and cheaply. Heroes improve certain units during a battle. There are also flags on the island, indicating places where other buildings can be constructed. Crystal mine extracts raw crystal. At the beginning, the player can change the rate of Wood and Metal gathering (later a new material - Crystal - becomes available as well) using sliders - they appear when a player moves the mouse cursor over the raw materials control panel. If the gathering rates are set too high, the Energy will be drained. The best strategy is to keep resources gathering rate balanced, so that each of resources is acquired at similar pace most of the time. This is a centre of an island. Each level of the city speeds up constructing of other buildings on that island. 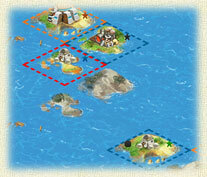 In addition, here you can change the name of the current island. To do this, click on Change the Name of the Island. 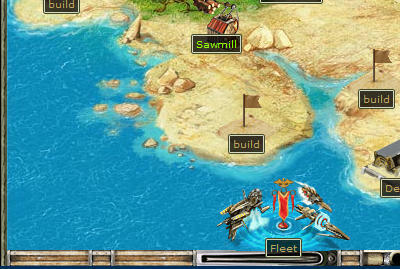 There is a place from which you can control your fleets, located in the lower left corner of the island view. Click it to enter a screen where you can create, review and managage fleets (you can manage your fleets as well as see allied and enemy fleets connected to your islands - on differents tabs inside Fleets screen).